Last year we wrote about a hospital in Mexico City that has a façade that literally purifies surrounding air – now there’s another one in Milan, Italy. The 6-story Palazzo Italia has a similar appearance to its predecessor. Crowned by a glass canopy of solar panels, the façade is designed to look like a petrified forest with 2200 tons of photocatalytic concrete. The architects say it mimics the role of trees by cleaning the air. Like the building in Mexico City, the materials react with sunlight to break down nitrogen oxide within 2.5 meters of its surface. About 80% of the materials are recycled and a company called Italcementi makes the concrete. Because of its air purifying ability, Chicago is experimenting with it to pave roads. "The entire outdoor surface and part of the interiors will consist of i.active Biodynamic cement panels," says Italcementi. "In direct sunlight, the active principle contained in the material ‘captures’ certain pollutants present in the air and converts them into inert salts, helping to purify the atmosphere from smog." 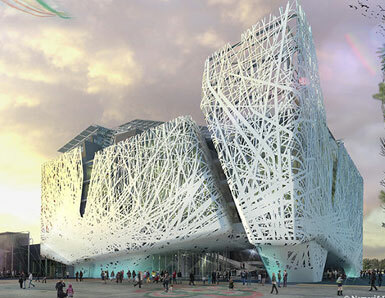 Palazzo Italia will be the centerpiece of the Universal Exposition of 2015: Feeding the Planet, Energy for Life, expected to draw 20 million visitors with a focus on how to feed the planet in the face of shrinking resources. At almost 100,000 square feet, it has a central square, offices and meeting rooms, and temporary restaurants during the Expo. Afterwards, the structure will remain as an icon of sustainable design. Architects Nemesi & Partners won an international competition to design the pavilion. Other innovative building designs we’ve written about include an algae-covered apartment building in Hamburg, Germany, a skyscraper in Indonesia that’s shooting for net-zero energy, and a tower in Taiwan. 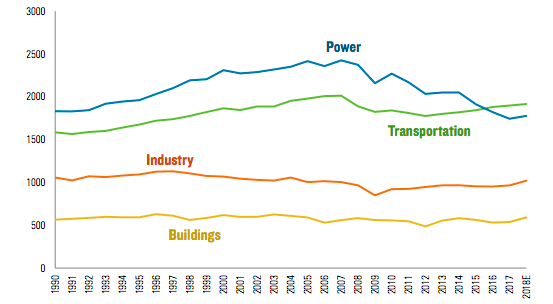 Read our article, By 2050, Urban Buildings That Breathe And Adapt.